Well, I guess later is better than never. I finally saw The Godfather. It has been recommended to me by person after person and at last I got around to viewing it. My friend Steve also had never seen it, so renting this classic seemed like the right thing to do. The right thing to do. That's interesting because that's something which it could be argued that the characters in The Godfather did not think about too often. But what is even stranger is that the reverse could also be thought of as true. And that cuts to the heart of what makes this movie so interesting: the fact that we see some of society's most evil characters in a sympathetic and almost honorable light. We feel their struggle and agree with their determination to "protect the family." Who among us could argue with Don Corleone's viewpoint about a man and his family? However, their means, perhaps, do not always justify their ways, but than again, consider the situations in which they are placed. "Hard times call for desperate measures," or so the saying goes. 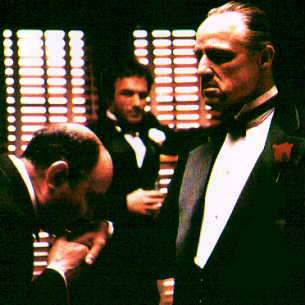 The Godfather also gives us something else: memorable scenes. This is evident from the very beginning when the head of the Corleone Mafia family, Don Corleone (played masterfully by Marlon Brando, more on him in a minute), is approached by several people on his daughter's wedding day to ask of him special favors. Who can forget the time when Don Corleone says, "What have I ever done to make you treat me so disrespectfully? If you'd come to me in friendship, then this scum that ruined your daughter would be suffering this very day. And if by chance an honest man like yourself should make enemies, then they would become my enemies. And then they would fear you." And later, after agreeing to help him, he shows him the door, saying, "Some day, and that day may never come, I will call upon you to do a service for me. But uh, until that day, accept this justice as a gift on my daughter's wedding day." And there are other quotes which are quite memorable as well. Especially, "I'm gonna make him an offer he can't refuse." 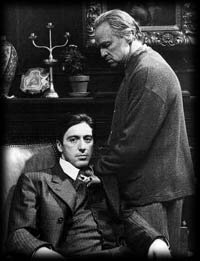 The story (by Mario Puzo with some help from director Francis Ford Coppola) has two main themes: the end of a great era for a great man (Don Vito Corleone) and the transfer of power to the next generation (Michael Corleone, and his transformation). The two primary roles are performed to a level beyond perfection. First of all, Academy Award winner Marlon Brando, as The Godfather, Don Vito Corleone, turns in one of the best acting performances that I have ever seen. He is now in his prime, or past it, and seems to us very grandfatherly and loving while at the same time exhibiting an immense sense of power and confidence. Brando's acting is subtle, which is even more of a testament to his greatness. Great moments that come to mind are a slight smile to his son Michael while lying in his hospital bed, and his forgetfulness brought about by trauma, stress, and old age just before his death. He dies wishing the best, and worrying, for his son Michael, while playing with his grandson in a garden. With his death, we feel a loss of greatness and a loss of someone whom we care about, because he seemed to care about so many. And then there is Michael, portrayed by a young Al Pacino, who immediately proclaims his mastery with this role. Pacino, as Michael, goes through a most extraordinary transformation. At first, we see him as a national war hero, who is troubled by his family's immoral dealings, and who ensures his girlfriend, Kay (Diane Keaton), that he is not like that. However, after his father is shot down on the street and he goes to visit him in the hospital and finds that no one is there to guard him, he begins to take matters into his own hands. He avoids another hit on his father as he and a terrified Enzo pretend to be armed outside the front gate. But when he learns that the Chief of Police is a puppet of one of the other families, he decides to get even. In one of the most heart-pounding scenes in Hollywood, Michael shoots down the Chief of Police and the head of the Tortellini family in a small Italian restaurant, and he escapes to Italy. At this point, Michael espouses violence as a means of protection. While in Italy, he becomes more confident in himself and his power as he weds a beautiful young girl, scaring her father into setting up a wedding before he even speaks to her. However, when she is killed in an attempt at his life, his anguish turns to anger and he returns to the US to begin to seek his revenge. His father, seeing that his first-born Sonny is dead, and in appreciation of his life having been saved by his youngest son, bequeathes to Michael the power of being the head of the family business (see image to left). After both his brother and his father have died, Michael really begins to show how he has been consumed by rage and the thirst for revenge, as well as the hunger for power. His eyes, throughout the movie, grow colder and colder, until, during the famous "baptism sequence", he has become as evil as can be (see image to right). What is equally frightening, is the fact that we, the audience, are really pulling for Michael the whole time. We want to see him get even. But somehow the way that he goes about it, lying in church at his son's baptism as he has the heads of the rival families murdered, we suddenly pull back in horror at ourselves and of his crimes. By the end of the film, after having lied to his wife, Kay, the door is slowly closed on her as Michael accepts deference and praise in the dark room where his father once took care of business. Now Michael is The Godfather. This transformation from an good man and hero who doesn't want to be involved into the powerful and evil Godfather that he is by the end is simply amazing to watch. The rest of the cast is so deep and so talented. You've gotta like James Caan as the hotheaded "Sonny", whose pugnacious ways eventually lead to his frightful assassination. His mannerisms are great. You get the sense of a rough kid who never really grew up. And then there is the admirable Tom Hagen (played by Robert Duvall, with hair). The Irish-German family lawyer who is like a brother to the Corleone sons after his having been taken in by Vito. Duvall is great in this role. Always thinking. Always controlled. And Dianne Keaton as Kay (who gets even better in Part II) was wonderful as she helplessly watches her husband become more and more evil. One of the best quotes of the movie comes when she begins to express her worry about the family business. Listen. Talia Shire (Adrian from Rocky and Francis Ford Coppola's sister) was great as the battered and rebellious sister. She was instrumental in providing the movie's most horrific scene in which she is severely beaten by her husband. Add to this great list of actors and actresses the long list of bodyguards, hit men, and family members who were so instrumental in making this movie so realistic. My hat goes off to Coppola who really had an amazing vision with this movie. It has been copied so many times since then, which is always the sign of greatness, but none has ever really reached the original. One other aspect to this film which makes it so much more interesting to watch, is how such an evil business is mixed in with everyday normal life. One of my favorite lines from the movie is from Clemenza who, on his way to knock someone off, he remarks to the driver, Paulie, "And watch out for the kids while you're backin' out." What perhaps makes this movie even greater, though, are the next two. 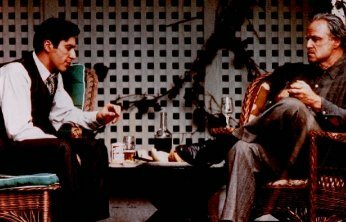 The second one, especially, really expands on the story, showing us where Vito came from as well as providing a continuation of the reign of Don Michael Corleone. My friend Rob told me, and I since agree wholeheartedly, that the best way to view this trilogy is to watch the first one, and then the second. Then, go back and watch the first one and pick up on all of the subtle connections between the two. For instance, this warning from Michael to his brother, Fredo. My personal favorite of the three. I pity the man who has not yet seen this movie. How would you rate the movie The Godfather? There have been 86414 people to visit this page since Fri, Oct 29, 1999. And you are the first person to visit this page today!